Stay in Salzburg's best hotels! Located at the banks of the Salzach River, in the center of Salzburg, the Hotel Stein has a history dating back to medieval times and was fully renovated and reopened in spring of 2018. Fantastic location right next to the city center, very friendly, professional and polite staff, very clean and cozy room with stylish interior. Family-run for 3 generations, the small and elegant boutique Hotel & Villa Auersperg is located only a 15-minute walk from the historic center of Salzburg and features a charming garden terrace and a... Vibe, decor, colors, overall ambiance, it just feels very modern and luxurious. Located in Leogang, a 9-minute walk from Krallerhof lift, Stockinggut by AvenidA Hotel & Residences Leogang by Alpin Rentals offers amenities including ski-to-door access and a spa & wellness center. - Excellent design, lights, furniture; everything is made with good taste and good materials - Rituals room fragrances make nice ambience - staff is very sweet and attentive - location! Perfect for skiing as you are directly on slope - breakfast is good, freshly made omelettes, good coffee, attentive people at BF service - for the restaurant: we loved Ceasar salad with shrimps, we ordered it twice during our stay, thought I normally ignore this salad, but here they make it fantastic! Set in Katschberghöhe in the Carinthia Region, only 328 feet from Tschaneck ski elevator and 2297 feet from Gamskogelexpress, Gasthof Bacher provides ski-to-door access. The hotel has a superb location: directly on the ski slopes, room was nice & clean, with great view. The spa area is really nice, sauna has a great window view. Parking is free of charge directly in the front of the hotel. Great atmosphere, very friendly staff. Located in Flachau and with Zeitmessstrecke reachable within an 11-minute walk, Enjoy the alps has a seasonal outdoor swimming pool, non-smoking rooms, free WiFi and a spa & wellness center. Everything is perfect : location, furniture, cleanliness, comfort, service, etc. The owners of the hotel are the sweatest couple I've ever met . I recommend it for families and couples . Best wishes for Thomas and Nicole . Featuring ski-to-door access and garden, Landhotel Berger is located in Eben im Pongau, a few steps from Popolo 1. Offering a restaurant, the property also features a terrace, as well as a sauna. Beautiful design, everything brand new. perfectly clean and beautiful nature around. Nice restaurant. Located in Russbach am Pass Gschütt, an 11-minute walk from Hornbahn, Hotel Kronenhirsch provides a garden and terrace. Each room at the 3-star hotel has mountain views and free WiFi. Everything about H. Kronenhirsch is lovely and makes it worth recommending. From the thoughtful breakfast arrangement, to the impeccable cleanliness, to the modernly, somewhat minimalistically and tastefully decorated rooms, to the coziness of the beds - we have slept unturned, the mattress was the most comfortable you can find away from home. To top it all, our hosts were the most kind and considerate - always ready to tend to our needs, to offer advice, to point us to the best things to see and to do whichever way we wanted to go. All things considered, this was a delightful stay. The Gosau & Russbach regions are gems best served from H. Kronenhirsch. Surrounded by meadows and mountains, Gasthof Erbhof Anderlhof and offers a restaurant serving Austrian cuisine, a 5-minute drive from Leogang’s center. The price seemed a little low and we expectedted the worst. Located a 2-minute walk from the Spa Amadé, the family-owned Landgasthof Alpenblick offers free Wi-Fi and modern country-style rooms in central Altenmarkt. Extremly pleasent people and beautilfull nature. This 4-star hotel in Rauris is just 262 feet from the slopes of the Rauris Ski Area. It includes a tennis court and a spa area with an indoor pool. Great location, charming older hotel with great meals and facilities. Located in Bad Dürrnberg, a 25-minute drive from Salzburg, Hotel Garni Kranzbichlhof offers a sauna area, a beautician, and a physiotherapist also offering cranio-sacral therapies. I had my best sleep in whole of my Austria trip, and the trip included Innsbruck and Vienna. Located at 3.9 feet above sea level, the Bergheimat is a traditional 4-star hotel in Mühlbach am Hochkönig. It features a large spa area and access to many hiking trails. Very friendly and service minded staff. Delicious organic food. Great location for hiking. Located in Bramberg am Wildkogel, this 4-star hotel is just 164 feet from the slopes and 328 feet from the Smaragdbahn Cable Car. It offers a spa area and free Wi-Fi. The breakfast is aleays great and the coffee machine has many varities. Located in the center of Großarl, Hotel Krone is just 820 feet from the Großarl Cable Car and the Ski Amadé Region. Very clean hotel. Good breakfast. Overlooking the town of Mittersill and the Hohe Tauern Mountains, the 4-star superior hotel Schloss Mittersill is a medieval palace with a unique historic ambiance. An amazing display of Austrian cultural & architectural heritage. 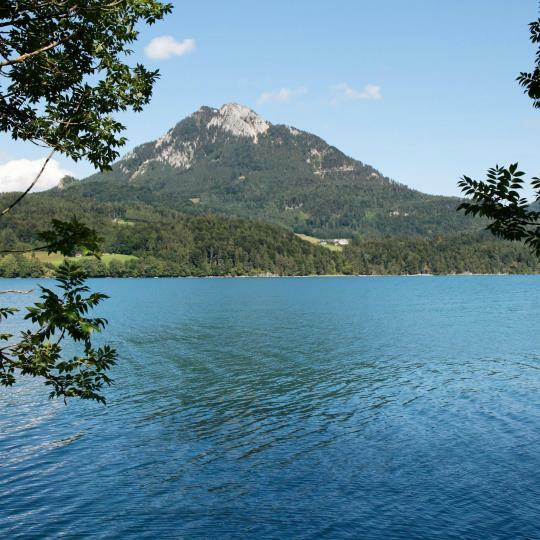 Set along the shore of the Ritzensee Lake and framed by picturesque mountains, the Ritzenhof offers state-of-the-art wellness facilities, free WiFi, and a restaurant serving nouvelle cuisine, prepared... Staff was very kind and helpful even one or the other was just okay. Located in the center of Altenmarkt im Pongau, Landhaus Steiner has a spa area with an indoor pool. The free ski bus to the Ski Amadé region stops right outside. Family owned very friendly Owners served us Expresso while the room was cleaned ,we arrived Early. Surrounded by the Hohe Tauern Mountains, this 4-star superior hotel in chalet style in the scenic village of Großarl is only 328 feet from the cable car and the Ski Amadé Ski Area. Lovely traditional-style Austrian resort. Located in the center of Eugendorf, a 15-minute drive from Salzburg, Salzburg Hotel Holznerwirt occupies a historic building dating back to 1390. -Perfect Breakfast (wild variety, BIO, delicious..
Hotel Lärchenhof offers newly designed rooms with balcony, free parking, and free Wi-Fi access. It is located right next to the ski slope in the Katschberg skiing and hiking area. Very nice room, extra comfortable bed, the star ceiling is beautiful. Hotel Zeferer offers rooms with balcony in a sunny and quiet location on a high plateau, 1.9 mi away from Filzmoos. Fantastic location. Comfortable, quite and clean room. Pleasant staff! 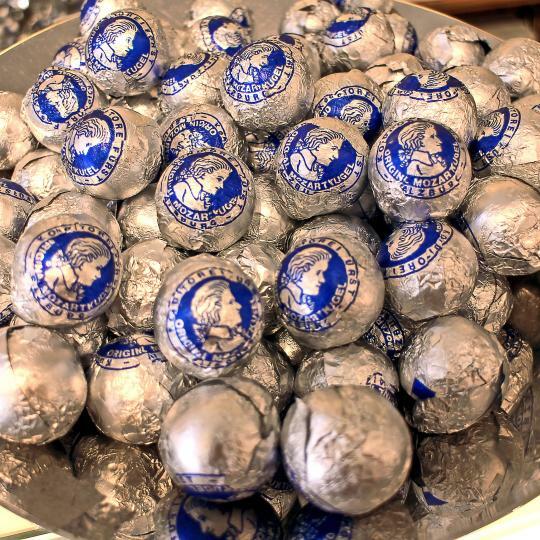 Head to Salzburg´s Fürst Confectionary and try this hand-crafted marzipan and nougat praline, named after composer Wolfgang Amadeus Mozart. 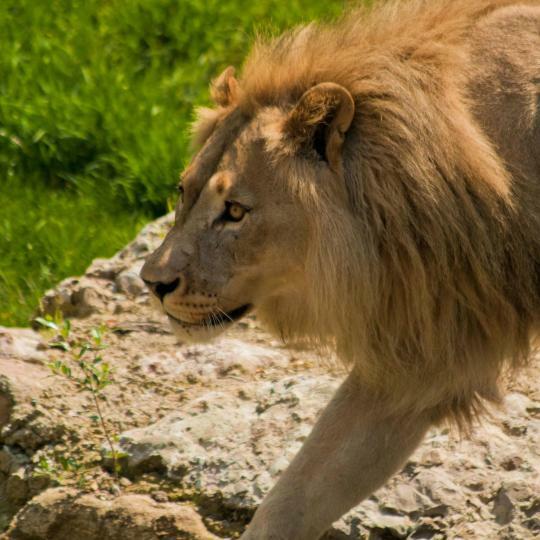 Admire 140 species from all over the world in this 14-hectare zoo, set at the foot of the Hellbrunner Mountain. Check out the Flying Bulls Aircraft Fleet, a collection of Formula One racing cars and interesting art exhibitions at this unique museum. Located on a small hill, this medieval castle is one of the largest in Europe and offers breathtaking views of the surroundings. 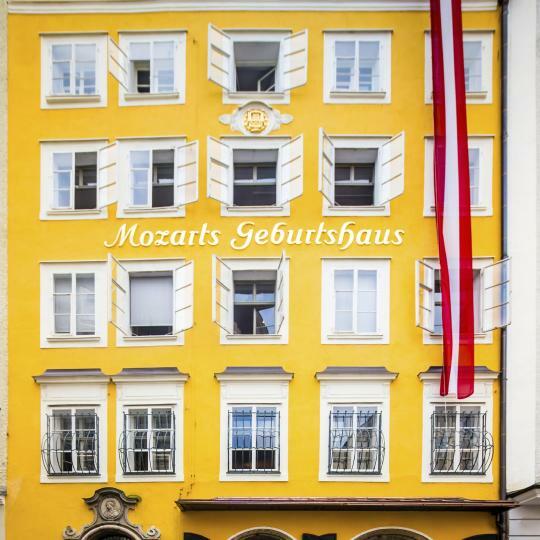 Learn everything about Mozart´s early years, his first instruments and his passion for opera at this historical building in Getreidegasse 9. These landscaped gardens are dotted with sculptures of mythological figures and are the perfect place for a relaxing afternoon. 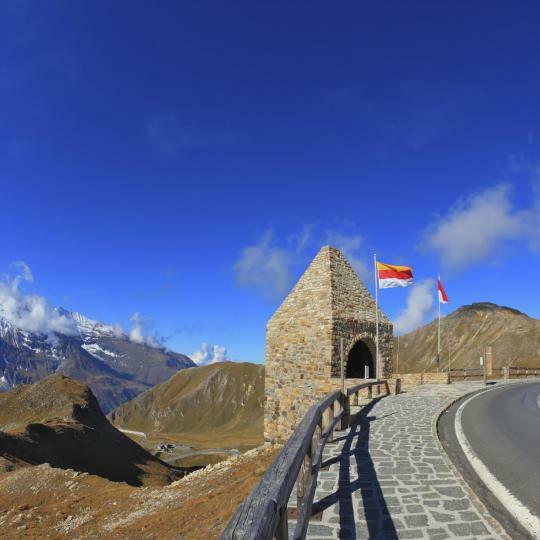 Take this 48-km panoramic road and explore the wonderful alpine world around the Großglockner, Austria´s highest mountain. Famous for its high-quality turquoise water, this lake features many peaceful and secluded bays, a perfect setting for a relaxing swim. 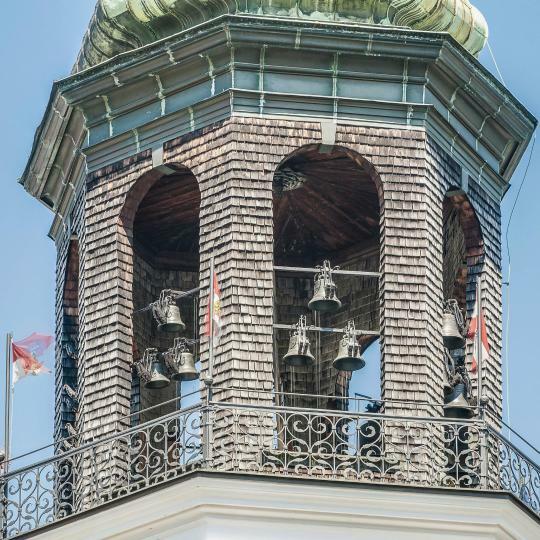 Stop at the Residence Square and listen to the famous Glockenspiel, located in the New Residence's Bell Tower and playing 40 melodies. Join this picturesque ride to the story´s settings and learn more about the Trapp Family while listening to the movie´s soundtrack. The best is to buy a Salzburg card. The best is to buy a Salzburg card. We bought the 48 hours Salzburg card. It is the best card. Buy it at the train station or at your hotel. It covers all bus, trams, cable car up to Mt. Untersberg, entrance to most or all sights such as Mozart home, boat ride, etc. Austria (especially Salzburg and Vienna) is an ideal country for a classical music lover. 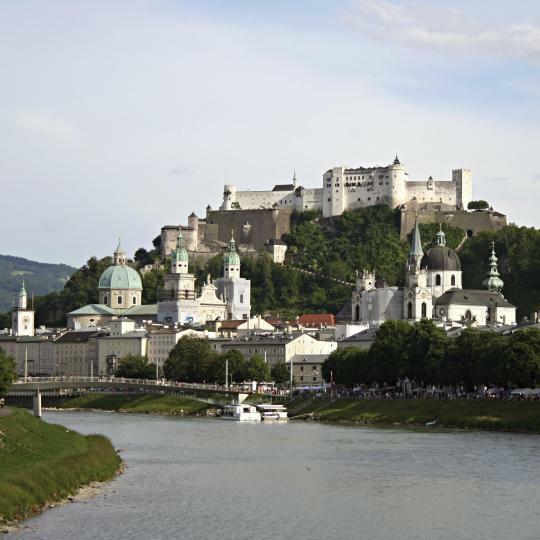 Even Salzburg is the Mozart and the Sound of Music city, it also offers stunning scenic views. We got the best city and scenic view from the top of the Hohensalburg castle. There are buses/trams but you will be enjoyed exploring the city by walk. It is an ideal romantic city to visit if you like music, nature, castle and such but not for a shopper and a nightlife (it is really quiet at night). After visiting the old town (which is like a city center here), the castle, and Mozart's residence (and/or Mozart's birthplace), Mirabell Palace, I would highly recommend you to still stay in Salzburg and take a one-day-trip train to Hallstatt and/or Obertraun (could go there by bus from Hallstatt). It is easy to go and it is much cheaper to stay in Salzburg (not only in term of hotels but also in term of great food). Also, local authentic Salzburg restaurants are unique and tasty. And I believe you could not probably get some menus and tastes in Vienna. We stayed near Salzburg train station. We think it is the best location to stay because it is an only 20-min walk to the old town, easy to get to other nearby cities, proximity to a variety of cafes/restaurants, close to late-night supermarket and such. There are direct buses/trams from/to the airport. Everything! Beautiful architecture, wonderful concerts, variety of restaurants& cafes in all price ranges, delicious food. It’s a perfect city for walking and is very charming. Everyone we met was polite and gracious. 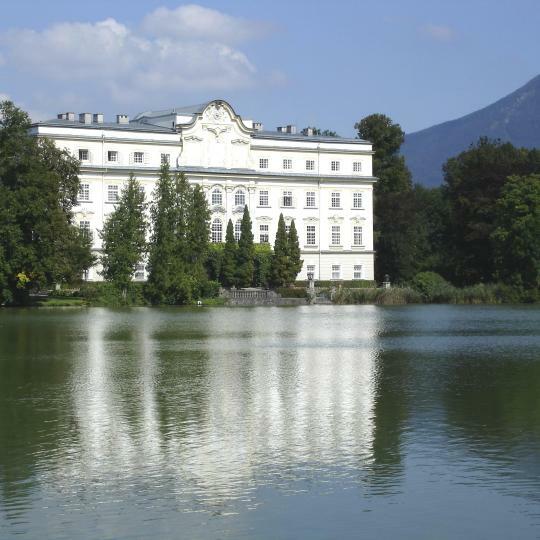 Salzburg is a must for music lovers. I definitely plan to stay there again. This was my first trip to Austria, and Salzburg really captured my heart! 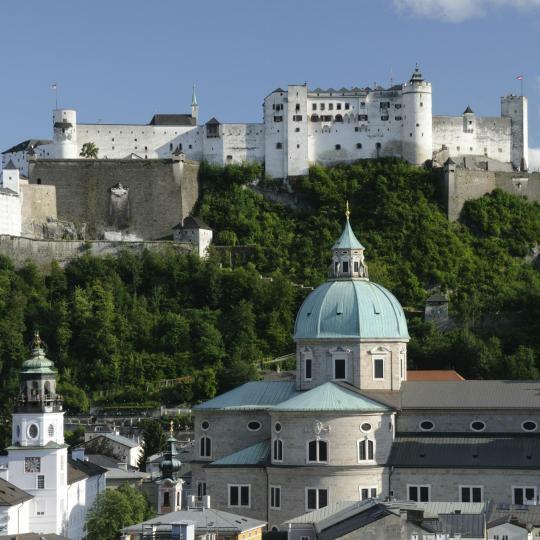 The Sound of Music tour is a must-do, as is a visit to the Hohensalzburg Fortress. There are so many amazing restaurants, and things to see just walking around old town. I plan to return in the future! 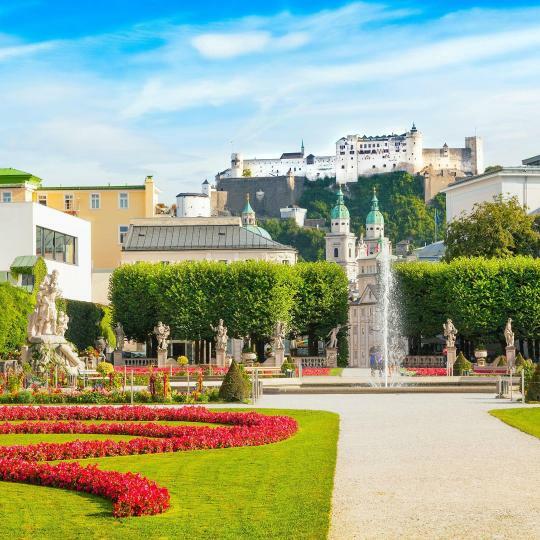 Everyone who knows the Sound of Music will be familiar with Salzburg, but the appeal for us was the historic buildings, alleyways and relative proximity between the famous sites. The locals too displayed genuine warmth and made us feel really welcome. Given the shortness of our stay we were only able to take in a portion of the sites, but we were certainly not disappointed with what we did see, taking in both Mozart’s birth place and his residence. A chief highlight for us was attending an evening concert performance by a local chamber ensemble who treated us to flawless performances of Mozart, Mahler and Brahms at the stately Mirabell Palace. The local people in Salzburg are very friendly. The local people in Salzburg are very friendly.They always wish us with a smile. The city is amazing, with lots of attractions. Stiegl brauwelt, the cable car and the Dom are must visit places. Too many visitors the end of May. Too many visitors the end of May..we prefer shoulder seasons in order to avoid all the crowds, howvere wonder if Salzburg and travel in general is now too popular to ever avoid crowds in those “must see” areas. Many attraction to visit. Due to insufficient time, i only managed to visit (1) fortress on top of mountain; (2) hellbrune palace(must do tour for "tricky fountain"; (3) mirabelle garden. Must get "salzburg card" that ables you to go on all transportation & attractions!!! Totally worth it! Salzburg is an excellent city to visit, I would suggest getting a Salzburg card. I have to come back because I didn't get to see everything that I was interested in. Very nice small city. Must see fortress and museums. Try restaurant in Hohensalzburg fortress can see the view of city from up and tasty food also. Easy transportation but waiting quite long maybe because its small town with few people. Our entire stay here was exceptional from the beginning until the end. The owner, Frau Herta Farmer is very friendly, kind and makes you feel like you are old friends. The overall atmosphere was perfect. The hotel is located in a traditional Austrian village, a location from which you can easily access many tourist attractions (Salzburg, Hallstadt, Salzkammergut). The rooms are spacious, with great views and very clean and tidy. In two words: perfect location! The hotel staff at K6 Rooms were extremely helpful, explaining local attractions and bus services. We only stayed one night and took an evening train out of Salzburg the next day, and they checked our bags so we didn't have to carry them around the city! We ended our stay with a drink at the bar (served by another excellent employee) before collecting our luggage and waving goodbye to Austria. By far our favorite hotel during our stay in Europe. The location was ideal for walking around Salzburg, close to wonderful restaurants and across the street from a grocery store. The apartment was well-equipped with kitchen utensils, including a Nespresso machine. It was nice to be able to borrow from the hotel's DVD collection and use their sauna and spa services. The masseuse was great. The hotel staff was very accommodating to any requests that we made and quick to respond to any issues. Awesome Location, the hotel was literally 10 minutes walk from 'Salzburg Main train Station' (Hauptbahnhof). Take bus number 5 which is 5 minutes walk from the accommodation, and Voila, you'll be at Mirabell garden and anywhere in the center, or catch a bus that directly takes you to Untersberg mountain! Since the place is not so crowded, the place is quiet at night and cozy. This is WONDERFUL! Everything about it is upscale. There is an elevator to reach the top floors. Immaculate cleanliness. Wonderful breakfast with eggs cooked as you like and served at the table. Michaela is fantastic. We stayed three days on our arrival in Salzburg and found ourselves staying three more days before leaving Austria. Do not miss this four star hotel! I liked that the room had a big table near the wall that was very usefull for putting your stuff. I guess that the price as in the period we arrived at the same price you would only get hostel accomodation, but in Salzburg. Keep in mind that even though the distance from the hotel to Salzburg is for 11km the return will take you 22km. Excellent for families with young kids, especially when you plan to walk in downtown Salzburg. Breakfast was really good. Very clean and comfortable hotel with large family room. Staff was very helpful and understanding with the flexibility of our traveling plans. Overall, we were quite happy with our choice of Wolf Dietrich Hotel. The apartment is new and modern in an ideal setting in the Austrian Alps just 30 minutes from Salzburg and 40 minutes from Berchtesgaden. The beds were comfortable, the apartment was well equipped, and the owners were welcoming. Location is great, just next to main train station, bus stops and shops. Well equipped (washing machine, dishwasher, coffee machine in the kitchen..) and neat apartment with view to Gaisberg and Festung Hohensalzburg. The hotel apartment have nice view and surrounding, very clean and well maintained. Good for family. The owner, Renatte, was very helpful and communicative. Very recommended for stay in Salzburg. Fave hotel in Salzburg I’ve been staying here since 2013! Amazing location staff rooms view everything. And the rooms are very spacious bigger than most rooms in Europe! Salzburg is amazing; hotel was clean, quiet, and very new. Staff were accommodating and were very gracious when we requested additional bedding and towels. It was an authentic experience in a family like atmosphere. Wonderful hotel that gave you a taste of what it was like to live in Salzburg. The front desk was extremely helpful! I will recommend Hotel Meininger to any friend whom I know will be in Salzburg! The hotel was wonderful! The location was perfect to enjoy all the sights and things to do in Salzburg. 5 stars! !